I have been following this series since it began and was getting a bit behind. With a new book due out soon, I realized that this Christmas edition of the Mainely Needlepoint series was just what I was looking for, now that I am beginning my Christmas reads. Angie and the Mainely Needlepointers are getting set to have a quiet Christmas season when Patrick West, Angie’s boyfriend, drops a bombshell and asks for favours. His mother, actress Skye West, has decided to come home to Haven Harbor for a white Christmas. Not only that, but she is bringing home some people she is working with on her recent, troubled movie. He needs help decorating the mansion, making needlepoint gifts for each of the guests as well as inviting them all for Christmas Eve. There go Angie’s plans down the drain. She had wanted to have a quiet Christmas with Patrick, but any time with him is a gift after all he has been through so she helps him get everything ready for his mother’s arrival. Skye and her entourage arrive but before they spend one night in Maine, one of them is found dead in the snow. 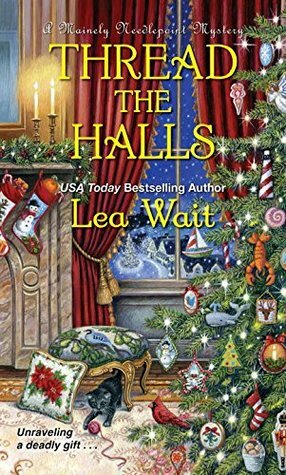 While trying to keep Christmas on track and find the killer, Angie becomes a suspect, not only in the murder, but in poisoning Patrick as well. There is a definite chill in the air and it’s not from the typical Maine winter weather. There is a killer nearby, she just needs to figure out who before it is too late. Angie grows more in each story. She is really getting comfortable running the needlepoint business and her own needlepoint skills are improving. Whenever a dead body shows up, she tries to stay out the investigations but she ends up right in the middle anyway. Angie’s relationship with her grandmother is so special and I love when she laments about being an adult and not having her grandmother around to make her hot cocoa or whatever else she needs. Skye and Patrick are rich and used to getting what they want, so they take some getting used to, but they are not rude and malicious. Skye is a mother first, so whenever something happens to Patrick, she goes all mama bear, not always thinking about how she treats others. I am enjoying the relationship of Angie and Patrick, but he needs to think more about her, than his mother. I hope that improves as the series goes forward. I had a niggling in the back of my mind about one of the characters as the story unfolded and I was right in my suspicions. The motive for the murder was the one sticking point so the twist at the end was a great way to wind up this mystery. The story was well paced, with some surprises and that huge twist. Each chapter begins with a tidbit about needlepoint or a bit of a historic sampler, but you do not have to read them if that does not interest you. Another great entry to this series. I recommend it to cozy mystery lovers, especially those who love to learn about the area the story takes place. About the Book (From Goodreads): Christmas in Haven Harbor, Maine, means family, trouble, and murder . . . This Yuletide season, there’s no time for Angie Curtis and Patrick West to linger under the mistletoe. Patrick’s being needled by his mother–movie star Skye West–to set the stage for a perfect white Christmas as she brings her costar, screenwriters, and director home for the holidays. With his mother’s long list of wishes, Patrick’s becoming unraveled. To help, the Mainely Needlepointers offer to decorate Skye’s Victorian mansion and create needlepoint pillows as gifts for the guests. About the Author: Maine author Lea Wait writes the NYT-praised 8-book Shadows Antique Print Mystery series, and the USA Today best-selling Mainely Needlepoint series which debuted with TWISTED THREADS in January, 2015. Wait also writes acclaimed historical novels for ages 8 and up set in 19th century Maine, the latest of which, UNCERTAIN GLORY, takes place in a small northern town during the first two weeks of the Civil War. Lea’s LIVING AND WRITING ON THE COAST OF MAINE, about being an author and living year ’round in Maine with a husband who’s an artist, also includes writing tips. While she was raising the four daughters she adopted as a single parent she worked as a manager for AT&T. Now she writes full time and speaks at schools and libraries. She loves rowing, visiting historical sites, and, of course, reading and writing. 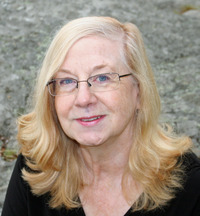 See her website, www.leawait.com, and the blog she writes with other Maine Mystery writers, http://www.mainecrimewriters.com, friend her on FB and Goodreads, and, if you’d like to be on her email list to find out when her next book will be published, send her your email address at leawait@roadrunner.com. I am beginning my Christmas reads, too!! So excited! With the cooler weather coming in, it certainly gets me thinking about Christmas. I love the Christmas books and the Christmas movies. Enjoy your choices. Lovely review Carla! Another series that catches my eye but haven’t had time to go back to yet. Thanks Carrie, I like this one, but the quirky characters you love are not in this one.